Following the tragic burning of the Notre Dame Cathedral spire in Paris, Ubisoft – the developers behind the historically driven Assassin’s Creed series – has responded charitably. For the next week (until April 25), PC users will be able to download Assassin’s Creed Unity for free. This entry into the franchise lets players explore late 18th-century Paris during the French revolution, including a recreation of the Notre Dame Cathedral. Previously a console exclusive for Xbox One, Studio MDHR's Cuphead is now available on Switch and speaking as a big fan of the game, I highly recommend it! In fact, the port to Nintendo's hybrid is nigh-on flawless - indistinguishable from Xbox on a living room display and with the added bonus of portable play that holds up beautifully for gaming on the go. Put simply, it's a lovingly crafted, zero compromise port that exceeds expectations. And it's worth remembering what makes Cuphead so special in the first place. It combines classic retro-style shooting gameplay with an absolutely unique 30s cartoon aesthetic. Traditionally drawn and animated characters mix it up with water-coloured painted backdrops that scroll independently for a cool parallax look. Studio MDHR adds an extra layer of authenticity to the visuals by using a distinct range of post-processing effects that help to sell the impression of the action taking place on aged film stock, displayed through the lens of an old projector. Taken as a whole, Cuphead is the closest we've seen to an interactive cartoon in this generation. Back in the day, the developers started out by using the now-obsolete XNA framework, before taking the decision to move onto Unity as the engine of choice. It's a technology that's delivered uneven results - even in predominantly 2D-based games - but polish and performance on the original Xbox One and PC versions was second to none. We even managed to play the game smoothly on an old Dell XPS 13 with integrated graphics. With that in mind, it should come as no surprise that the Switch conversion is just as good. The 2D art certainly helps in the sense that Cuphead is essentially 'resolution proof'. Scale up the Switch's mobile 720p output to match docked mode's full HD presentation in a side-by-side comparison and the results are indistinguishable from one another, and in turn, identical to the PC version running at 1440p or Xbox One X outputting in its 4K display mode. The way the artwork was crafted means that there are no harsh pixel edges to give away a 'native resolution' as such. Interestingly, the Switch download weighs in at just 3.3GB - around a quarter of the size of the Xbox version. However, the graphics are identical to the Xbox game and animate in exactly the same way, while audio quality is a complete match. Cuphead is receiving a physical release, so reducing the file size footprint means that Studio MDHR can ship the game on a smaller, cheaper cartridge. Perhaps this explains the game's radical shrinkage in the move to Switch, but thankfully this does not seem to come with any kind of noticeable compromise. Whatever compression system the developer uses does not seem to cause issues with loading times either. Cuphead on Switch actually loads its levels faster than the launch code on Xbox One, and initially, I wondered whether the move to NAND may give the Nintendo handheld an edge over the Xbox's mechanical HDD. Well, excessive loading times were one of my very few complaints about the original release but on revisiting the game, it's clear that Studio MDHR took the criticism onboard and drastically reduced loading times on the Microsoft console, which is now faster than Switch. Incidentally, the stutter I noticed in the Windows Store PC release back in the day has also been fixed. Performance-wise, it's business as usual for the new port. Cuphead delivers a locked 60 frames per second on both docked and mobile Switch configurations, meaning that it's absolutely on par with the Xbox One version in terms of fluidity and consistency - a boon for a sideways shooter like this one. Some early reports have flagged slowdown on super moves and parries, but this was always there - the game emphasises these moves with split-second freezes in a similar way to weapon impacts in The Legend of Zelda. We can tell it's not game slowdown as such as the post-process pipeline continues on regardless, subtly altering each and every frame. In fact, the only issue I found was a slight animation stutter in one round that I never noticed again. The bottom line is that beyond the technical minutiae, the takeaway here is simple: Cuphead on Switch is a complete match to Xbox and PC in terms of both visuals and performance. 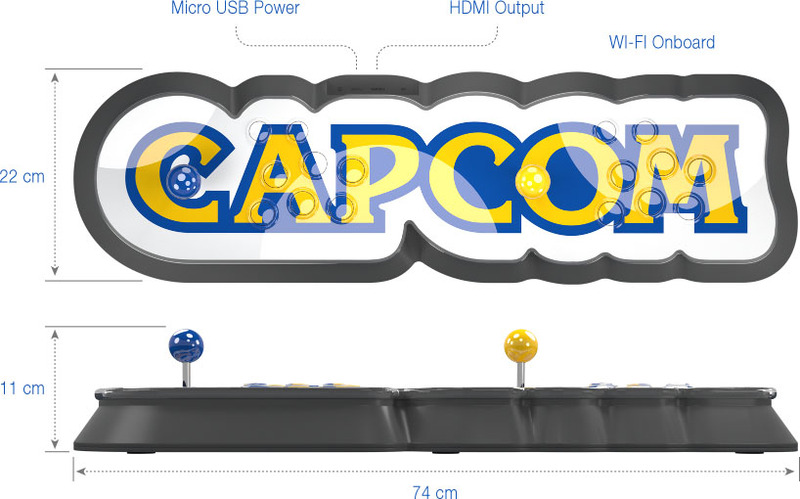 Following the success of Nintendo's mini consoles and with Sega about to enter the market with its own slimmed-down take on the Mega Drive, Capcom has now entered the fray with its own spin on the phenomenon - a massive £200 arcade stick that's shaped like the Capcom logo which allows players to enjoy 16 classics of the 90s. It's slightly disappointing that it doesn't stretch to CPS3 games - although that particular iteration of Capcom's arcade board never saw much support, it did host Street Fighter 3: Third Strike, arguably the high point for the highly-regarded fighting series. Still, the Capcom Home Arcade stick does boast bespoke emulation from FBAlpha, plus WiFi support so you can partake in global leaderboards (but not, it would seem, play online). As with other mini consoles, it offers an HDMI out and is powered by Micro USB, and it's due out on October 25th. I waited online last night but nobody turned up, no invite, no zombies. After waiting till about 8.45 (because I thought it was an 8.30 start not a 9pm ) and not seeing anyone online, I started playing some BF5, but I quickly got fed up playing that with my controller disconnecting (yes its still doing it despite being fully charged). anywho...... maybe some other time for PvZ2, but I'm in no rush. Shame you missed us Orbs. We had some good games and won most of them and even got the guys a cheevo. Really enjoyed it and hoping for another one. I’m finding it difficult to commit to hosting at the moment with one thing and another but will try and join in when I can.